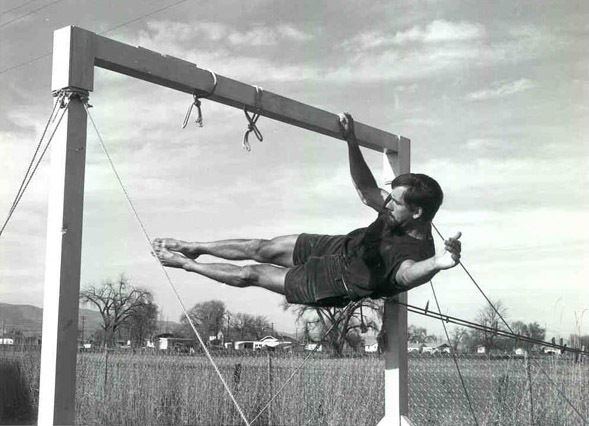 John Gill doing a one-arm front lever. John Gill has been called ‘the father of modern bouldering’ and with good reason. His vision of bouldering as an end in it’s self as opposed to training for roped routes was way ahead of its time. One of the first to use chalk and to embrace a dynamic style of movement on rock, our concept of bouldering owes a lot to John’s vision. Not only where his ideas new and forward thinking but physically he was futuristic, his problem The Groove in Colorado done in 1978 has only seen one repeat and is at least 7c+/V10, its so strenuous that one climber ripped their chest cartilage trying it. TheShortSpan: How would you define bouldering? JohnGill: The way I did in the 1950s – one pitch climbing of great difficulty, usually done close to the ground and unroped. I also felt a bouldering problem should have some kind of dynamic component. TheShortSpan: The internet is a great way of getting in touch with like minded souls and sharing information and you are obviously an advocate of the internet, do you have any regrets that it wasn’t available when you where a young boulderer. JohnGill: Not really. I have fun with it now, but years ago I was more interested in getting out and exploring, rather than communicating. TheShortSpan: Seeing as you where interested in gymnastics both as an end in itself and as a means of training for bouldering what do you think of the modern bouldering walls that range from an overhanging sheet of ply in a garage to huge indoor freestanding and featured boulders (have you seen the The Spot gym in Colorado), Jealous? JohnGill: I’m not sure I would have spent much time with them had they existed 40 years ago. My infatuation with bouldering and climbing in general was inextricably linked to nature. I enjoyed gymnastics for its own sake, and loved learning moves. It was serendipitous that it prepared me for difficult climbing as well. Nowadays, of course, training of the kind you describe seems to be necessary for the harder, modern bouldering problems. But its artificiality seems a little like junk food, compared to a nice rare steak from nature! TheShortSpan: Do you wish you had bouldering pads back in the day? JohnGill: Actually, no. If a problem had a really bad landing spot or was dangerously high, I usually set up a top rope, which is far superior to pads. There were exceptions, of course, like the Thimble – but that was a climb and not what I considered a boulder problem (it had no dynamic component). On the Thimble, a stack of modern pads – or an airbag – would have changed the character of the climb. Besides, the guard rail would still have been there. TheShortSpan: Have you ever been to Fontainebleau? TheShortSpan: Did you do any bouldering when you where in Ireland? JohnGill: No – this was a tourist trip with another older couple, after a math meeting in Norway. Besides, it rained every day! TheShortSpan: Considering your background in athletics, do you find you have more appreciation for the strength dependant style of climbing rather than more delicate, technical stuff? JohnGill: On boulders, delicate, tiny-holds work I referred to as “micro-climbing”, rather than bouldering. But, don’t assume that strong-arm routes are not technical. On the Groove, near Pueblo, I had to learn one of the most technical moves I’ve ever done, and it involved great strength and momentum. TheShortSpan: Do you feel happy about the acceptance that bouldering now gets from other climbers? JohnGill: Well, it’s still not uniformly accepted by the climbing community. I worried about acceptance for a while in the 1950s, then I got on with my life and forgot about it. It’s good that some people enjoy its challenge, but popularity is no issue with me. TheShortSpan: What do you think of sitstarts? JohnGill: Just another variant of the game. I did a lot of no-hands routes and one-arm routes years ago. Sitstarts lengthen the climb a bit and exclude large climbers, if that’s what you wish to do. TheShortSpan: How much esteem do you place in the first ascend of a problem, are you only interested in your first (and subsequent) ascent of the problem? JohnGill: My approach in the 1950s and 1960s centered on exploration and first ascents. I was never very interested in doing something that had already been done, when there was so much out there to discover – so many untried problems to solve. TheShortSpan: What is your favorite type of rock and style of problem? 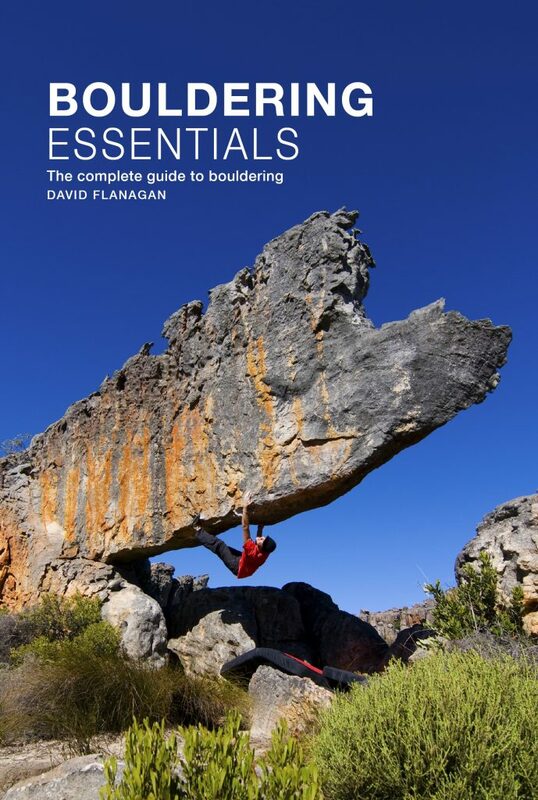 Do you see a big difference in bouldering on boulders as opposed to small cliffs or outcrops? JohnGill: Dakota Sandstone, and its athletic style problems. I never enjoyed bouldering on smooth, oval granite boulders with tiny little holds. TheShortSpan: Is bouldering an extreme sport? What do you think of this label? JohnGill: If it’s done in a dangerous manner, like highballs over a poor landing spot, I suppose it is extreme. I don’t like that aspect of it. TheShortSpan: Zen in the art of bouldering? JohnGill: It ultimately comes down to concentration, focus. Easy problems can be delightful moving meditations, and the more challenging routes can sharpen your ability to focus. Zen – type exercises can help you prepare for total involvement or total awareness, but if you only do them to allow you to do more exclusive climbs, you miss their greatest blessing: enhancement of the joy of climbing at any level of difficulty. If the only thing you can think of as you boulder is to punch out the other guy and boost your numerical rating, you miss the point of bouldering – which is to simplify the act of climbing, stripping away all extraneous factors. TheShortSpan: Do you see bouldering as a sport for the masses? Bouldering traditionally has always been a subsection of climbing in the sense that people have been climbers first and then discovered bouldering and become boulderers. Only recently have people started to come to bouldering without any other background in climbing, is this a good thing? JohnGill: No, it’s not a good thing. In order to appreciate bouldering as the essence of the act of climbing, as a perfect miniature, one benefits by having a background in traditional rock climbing, particularly mountaineering. Sport climbing won’t do it either, for sport climbing really is a kind of extension of bouldering (some climbers will disagree with this, but from my vantage point – having observed the origins of both – it does indeed appear that way.) After experiencing the limitations and dangers of trad climbing – particularly exploring and doing first ascents – one can have a deeper appreciation of the simplicity of bouldering, with its stripping away of all the parphenalia used in larger climbs. Coming into bouldering this way also increases the chances of you understanding your place in the long and illustrious history of rock climbing. Otherwise bouldering may as well be skateboarding. The influx of the masses will degrade almost any athletic activity. That which becomes popular and saturated with jargon is cheapened by the attendant media influence. That’s not to say “standards” won’t increase, for they certainly will, with many more skilled participants; but is an increase of standards, going from V12 to V13 for example, really part of the act of climbing? Or is it not merely a common trait of all athletic competition? You climb; you learn the ratings; you find at which rating level you climb; you try to advance to the next level, no longer focusing entirely on the climbing, but on its numerical representation. Such ratings are not intrinsic to the rock – they are a social construct. The tail wags the dog. Besides, rating schemes are always flawed. I can no longer tell where genetics ends and “difficulty” begins. Can you? The truth is each act of climbing by an individual is an individual act, unrelated to someone else’s performance on the same rock. When you truly understand this, you free yourself from the strong currents of mainstream practice and philosophy and appreciate the simple, unexploited experience of climbing. Thanks to John for answering the questions. John’s web site is well worth a look. This interview first appeared on The Short Span a few years ago. Pat Ament’s biography of John called “John Gill: Master of Rock” is available on Amazon.